Oil painting. Description: Oil painting, title "Dinnertime"; in the mess hall at Topaz, Utah, May 1945. Painted with mostly greys, touches of earthtones (e.g. reds, ochres, yellow) Oil on canvas, narrow slats nailed as frame. Condition excellent. 63 cts wide, 52 1/2 cts high, including frame. 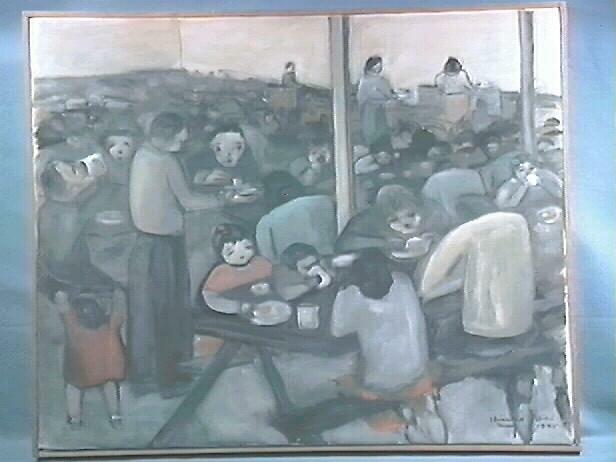 History: Painted by Mrs. Hibi during internment at Topaz, Utah, during WWII.